Hani Haybe wants to prove that women can play soccer.She was frowned upon for playing growing up. In her dreams she would be a professional player. 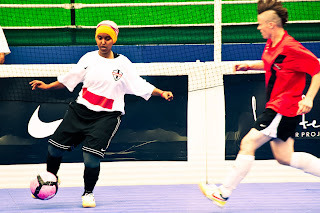 During the Street Soccer USA Cup she would get the ball in the backcourt, take such a small back swing you she was tapping the ball to a teammate, but suddenly her long range blast would bulge the back of the net on the other side of the court. The small, unassuming Hani is not modest when it comes to shooting. Her tough times being homeless have not hurt her self esteem either; she's set ambitious goals on and off the field.